Well, I spent most of this week sewing like a crazy woman and trying to figure out how to take pictures of myself in the outfits without looking like a total weirdo. You can check out some of my attempts here: Etsy photos . I'm trying a new technique where I cut my head off. I'm not very comfortable in front of a camera so this method seems to be going a little better. Eventually I managed to turn my attention away from photos of me because we had beautiful weather here this week, which led me back out to my garden. 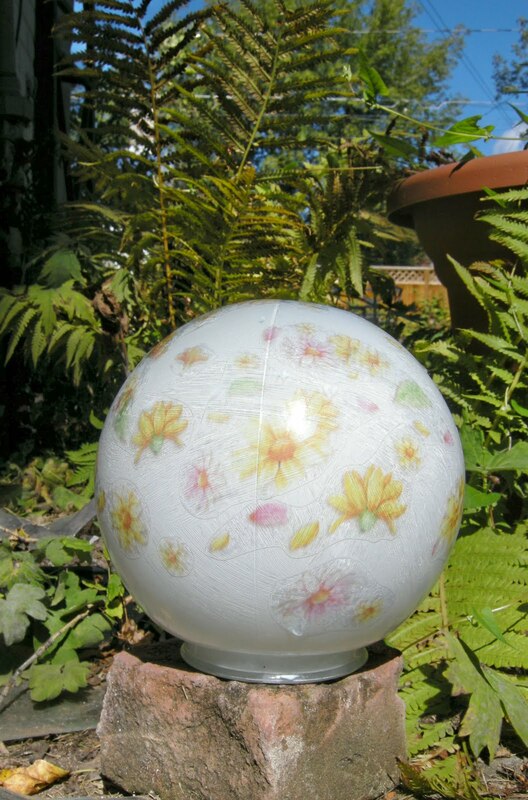 I've noticed a few cool 'gazing ball' projects on other blogs and I figured this was something that my own garden has been lacking. 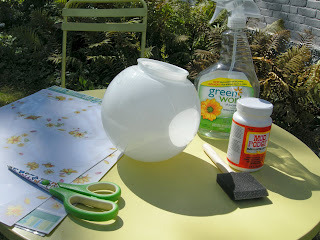 The other projects were all created with used bowling balls (see: Cap Creations and My Repurposed Life) . However, used bowling balls are pretty rare around these parts. So, I headed out to our local Salvation Army Thrift Shop and found a great substitute.....an old light fixture cover. This project is so simple and took about 10 minutes to complete (minus the drying time). Step 3: plaster it with Modge Podge. And here's the final result as it dries in the sunshine! I'm pretty pleased with it. The Modge Podge gives a nice swirly effect that catches in the sunlight. I might try another one with more sparkly stickers. Try it out and let me know what you come up with! Well, I've decided that I've talked about it long enough. I've been sewing lots of items to put into my etsy shop but I've been putting off taking photos for ages. Today was the day though. The whole process is taking longer than I would like but hopefully the more I do it, the faster I'll get. So, go to http://www.etcetorize.etsy.com/ and check it out. As part of the grand opening I'll be adding at least one new item every day this week! http://www.etcetorize.blogspot.com/ is where you can check in with me in the studio to see what else I'm up to besides sewing. Hope to see you on here soon and that you'll enjoy this new adventure with me!